1 For the pancakes: Combine all pancake ingredients in a bowl whisk until smooth. Let rest for 30 minutes. 2 Heat oil in a nonstick pan. Ladle in a small amount of batter, spread thin and cook until golden. Flip and cook until other side is golden. Remove from pan and place in an oven preheated to 80°C (approximately 175°F) to keep warm. Repeat until all batter is cooked. 3 For the filling: Peel carrot, rinse beans and leek. Drain bamboo shoots. Chop all vegetables and combine. Cut meat into thin strips and lightly season with pepper. Heat oil in a pan and quickly sear meat for about 1 minutes. Remove, wrap in foil and place in oven with pancakes. Cook chopped vegetables in drippings for 5-8 minutes. Season with salt and pepper. Keep warm over low heat. 4 Rinse lettuce and shake dry, cut into strips. Combine with vegetables. Remove pancakes and beef from oven. 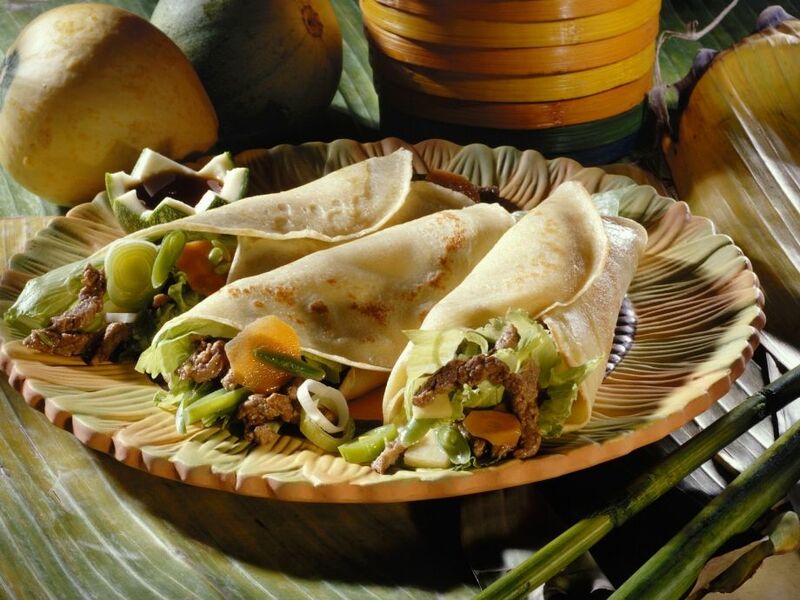 Distribute vegetables and beef onto pancakes. 5 Season with salt and pepper, as desired. Roll up and serve immediately.